A community assessment is a description of a community and its people. The purpose is to identify the needs of a community in order to provide services appropriate to those needs. A watershed-based community assessment is a description of the people who live within a watershed. The goals of a watershed-based community assessment are to to identify the water quality knowledge of the people, determine the concerns they face and weigh citizen enthusiasm for implementing a watershed improvement project. A straightforward way to estimate the knowledge, needs and will of a community is to simply ask residents their opinions about water, their understanding of water quality, their satisfaction with water quality in their area, and the methods that could best be used in increase their scientific knowledge of water quality and build their capacity to participate in an improvement plan. Assessing your watershed community's strengths and weaknesses is an important first step in planning and implementing an effective watershed improvement project. By taking the time to learn about your watershed community's issues, your group can discover new opportunities for increasing community involvement and individual commitment that will help ensure the overall success of your watershed improvement project. Without citizen "buy-in" to your watershed plan, it doesn't matter how much funding or technical support you may have, your project will not be successful. The toolkit can be downloaded by section in order to personalize your watershed's plan. For example, you may already be familiar with Excel software and won't need to print Appendix 3: Data Interpretation with Excel Software. 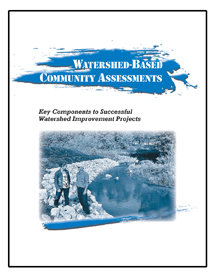 Section A: What is a Watershed-Based Community Assessment?